Basil Avery Tarrant grew up in 1920s Reading, where the smell of beer and biscuits from the local factories filled the air. He worked as an administrator in a local factory and spent his Saturday nights down at the music halls. But what happened to Basil during the war, and how he came to be awarded the Military Cross, remained a mystery to Chris and his family for nearly sixty years. In this emotional journey, Chris discovers that Basil was involved in some of WWII’s most significant campaigns, including the Dunkirk evacuation and the D-Day landings, and also took part in some of the most brutal, close-range fighting in Cleve. Dad's War is a profoundly moving and heartfelt tribute to a much-loved father, but it’s also a sincere and humble commemoration of the bravery and sacrifice of the soldiers of WWII. Chris Tarrant says he regrets not asking his father about his service during World War II. After his father did he decided to find out about his time in the service. Like so many men of his generation his father, Basil Tarrant, had fought in World War II and then spent the rest of his life saying nothing about it. Tarrant said his father came back battered but unscathed from the evacuation of Dunkirk in 1940. On D-Day in June 1944 he landed on Juno Beach fighting the Germans through Holland, Belgium and into the Rhineland. In 1945 his arm was shattered when a jeep in which he was a passenger drove over an anti-tank mine. He was awarded the Military Cross for his exceptional bravery in Northern France and recommended for a second one, which in the chaos of the end of the he never received. Tarrant says in researching the book, he visited the archives of his dad’s regiment in Salisbury. Then spent hours at the National Archives at Kew in South-west London and then on to the Imperial War Museum. The author said he read countless war books, biographies and autobiographies along with regimental histories. Tarrant said he interviewed men who served with his dad, who’d been through the same things that he had. He also read his father’s diaries. The author says his father was seventeen years old when he joined the Territorial Army. He said his father loved the Terriers. On August 25, 1939 he was called up full time with the 48 Division of his hometown of Reading. Four months later he was shipped off to France with the British Expeditionary Force. In 1943 he applied to join the officer cadet training at Sandhurst and in July that year he passed out with flying colors. He then was placed with the 5th Royal Berkshire where he was put in charge of the 12th platoon B Company. For his role on D-Day on Juno Beach Tarrant said he used his father diary. The author said that on the 50th anniversary of D-day his father and friends returned to Juno Beach but never discussed it with him. I touched only a few highlights of the book. If you are a World War II history buff this is a book for you. This story provides some guidelines for those trying to search for information about their family. Chris Tarrant narrated the book himself. Chris Tarrant reads his book about his father's exploits in WWII. 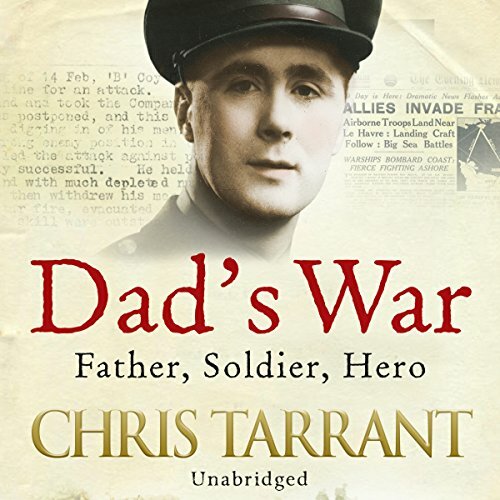 It's a very moving story told with Tarrant's usual verve and wit...but occasionally with sadness in his voice as he recounts the tale of a father he loved deeply but knew nothing about his bravery in the war.